Rob had been to Norway at least two times before, but when he heard that I was planning to cycle across Norway on a self-supported bicycle tour of my own, he quickly volunteered to join me on the trip (and I was happy to have him come along). 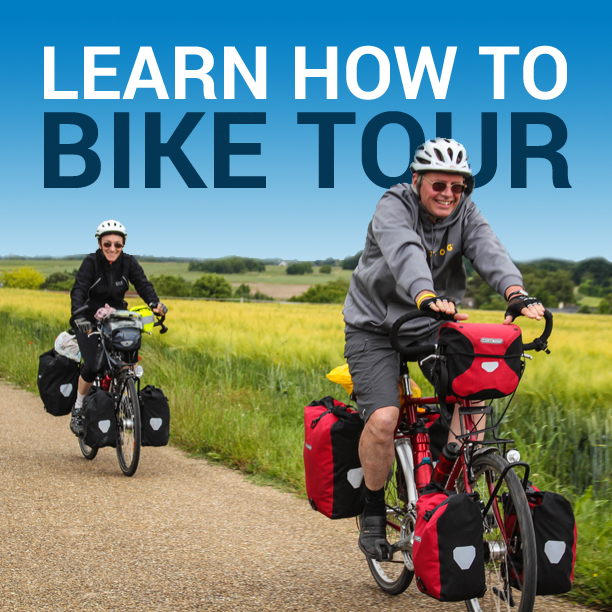 Rob and I first met in 2012 during the Bike Switzerland Challenge Tour – a week-long guided bike tour across the country… and have since done two other bike tours together: one in the Loire Valley of France… and another 650-kilometer bike ride in Finland. After finishing a bike tour in Norway with another friend of mine named Eric, Rob flew into Oslo, Norway and I met him there for the start of our 4th cycling adventure together. THE GOAL: To cycle across Norway (from Oslo to Bergen) in five short days – while having as much fun as possible along the way! 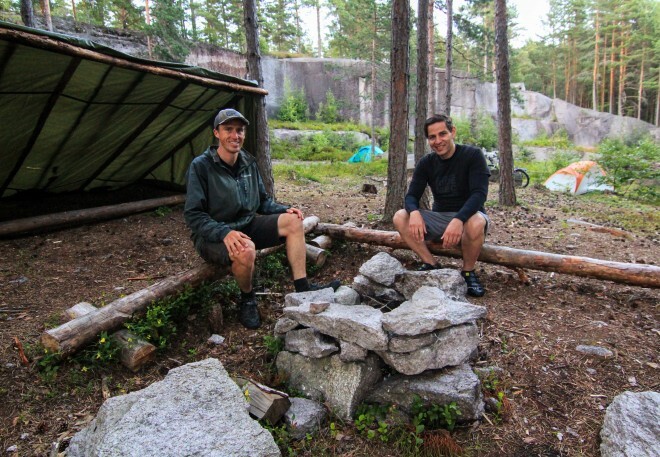 Before Rob arrived in Oslo for the start of our cross-country bicycle tour in Norway together, I had been participating in two back-to-back self-guided bike tours with a friend of mine named Eric Kiraly and a local touring company called Active-Norway. Once my bike tour with Eric was over, Eric and I traveled by train from Bergen to Oslo, just in time to rent an apartment in the city center for one night and meet up with Rob, who flew in from Italy (where he had been on vacation) later than same evening. Once in Oslo, Rob quickly put his bike together, we both bought some food for the journey ahead, and we slept well – knowing that he had a long several days of cycling ahead of us. After checking out of our AirBNB apartment in downtown Oslo, we said goodbye to Eric as he prepared to fly back to the United States… and Rob and I cycled a short distance across town to the headquarters of a local tour company called Viking Biking Oslo. We had signed up to participate in a 3+ hour guided bike tour of the city, which was a whole lot of fun – and a great way to see the city. But as soon as the bike tour was over, Rob and I jumped on our fully-loaded touring bicycles and began pedaling west with the goal of getting as far outside of Oslo as we possibly could before nightfall. Lucky for us, Oslo’s many bike paths and well-marked road signs made it easy to exit the city center and we were able to cycle about 50 kilometers in just a few shorts hours, before stumbling across a beautiful, isolated campsite in the woods, where we spent the night. We were on a tight schedule and needed to cover more than 500 kilometers in five short days if we were going to successfully cycle across Norway – from Oslo to Bergen. So we set the goal of pedaling at least 100 kilometers each day. During our first full day on the road, we managed to go a bit further than that, despite a late start to the day, and we spent the evening camped out in the forest. It was the perfect day of bike touring in Norway! When we woke up the next morning, we knew we were in for some bad weather… and we also knew that we had several large hills to climb ahead of us. But with the need to cover 100+ kilometers each day in the back of our minds, we straddled our loaded touring bikes and took off – mentally preparing ourselves for a long, cold and difficult day on the bikes. Even with the rain, cold and fog, we were able to cover a considerable distance, but after climbing only one of the three hills we hoped to climb that day, we decided to stop early, climb inside our tents and do our best to get dry. We ended the day soaking wet and shivering! Finding A Free Hot Shower! Luckily, bad weather doesn’t last forever. When we finally rolled out of our tents, the sun was out and the sky was clear. There was snow on the mountains in the distance and there were still two large passes to climb. After pitching camp and packing up our bikes, Rob and I stumbled across a roadside restroom equipped with free hot showers. After the previous day of rain and freezing cold temperatures, we couldn’t let this opportunity pass… and our free hot shower was one of the many highlights during our cross-country bike tour in Norway. We had planned on taking the road all the way from Oslo to Bergen, but once we reached the tiny town of Haugastol, Norway, we ran into a roadblock. The road was closed for cyclists and there was a massive sign saying that bikes were prohibited on the roadway. Apparently, there had been a large landslide and the road we had planned to take to Bergen was now blocked. Our only options were to A) take the bus to Bergen or 2) change our plans and cycle about 50 km on the famous Rallarvegen bike path to the city of Flan, where we could then jump on a train and travel back to Bergen that way. We didn’t want to take the bus, so we turned onto the Rallarvegen bike path, spent the night camping alongside the edge of the trail, and then limped along the road the following day – while Rob suffered from four flat tires on the dirty, rocky road. In the end, we were unable to make it all the way to Flam and were forced to jump on the train in Finse and ride from there back to Bergen – where we then spent the next several days being hosted by Rob’s friends Kjartan and Ingeborg. One of the finest and most famous cycling routes in Norway is the 82-kilometre long Rallarvegen (also known as the Navvies Road) running from Haugastøl via Finse to Flåm. Watch the video above and follow along as my friend Rob and I cycle the Rallarvegen bike path during our recent cross-country bike tour in Norway. After you see this video, you’ll understand why the Rallarvegen (and Norway as a whole) is such a popular cycling destination. Click here to see the photos from our “Cycle Across Norway” bike tour. This entry was posted in Bicycle Touring Pro Articles, Darren Alff's Bike Tour Blog, Europe, Featured Articles, Locations, Main Articles, Norway, Videos and tagged bicycle touring in norway, bicycle touring pro, bike across norway, biking in norway, cycle across norway, cycle touring in norway, cycling across norway, cycling in norway, darren alff, oslo bike tour, rallarvegen, rallarvegen bike path, rallarvegen bike tour, rallarvegen video, rob and darren, roberto lorusso, viking biking, viking biking oslo, what to do in norway.